The need for the ST225, RS Mk2, ST250 and RS Mk3 to have a more stiff engine stabilzer is well documented, we recommend the fitting of a suitable unit to all vehicles that are driven hard let alone tuned to produce more power! Many if not all models of aftermarket lower mount have a problem of sending engine vibrations directly through the subframe and into the cabin creating excessive noise. This noise is a direct result of having to use a small bushing and a stiffer than ideal rubber compound. This Lower Engine stabilizer has the perfect balance between low engine movement and low vibration transmission. Quite simply the Solid Bush is much larger than other aftermarket bushes so it absorbs more vibrations, much like the OEM bushing. It is also of 100% OE rubber density so is softer than other versions. How Long does it take to fit ? We can fit this unit at the workshops in under 20 mins but for DIY'ers it can be completed within 30 minutes with the use of a 15mm spanner. Will the bushing Fall apart ? The Low vibration Mount uses a large central bush which is bonded into the postion so will not deteriorate over time. We have sold 100s of these mounts over the years and have had nothing but positive reviews. The Pumaspeed Workshop team are ready to fit the Low Vibration Focus Uprated Lower Engine Stabilizer by Pumaspeed in our Head Office located here. Therefore making parts and labour a total cost £83.69 (inc. VAT). 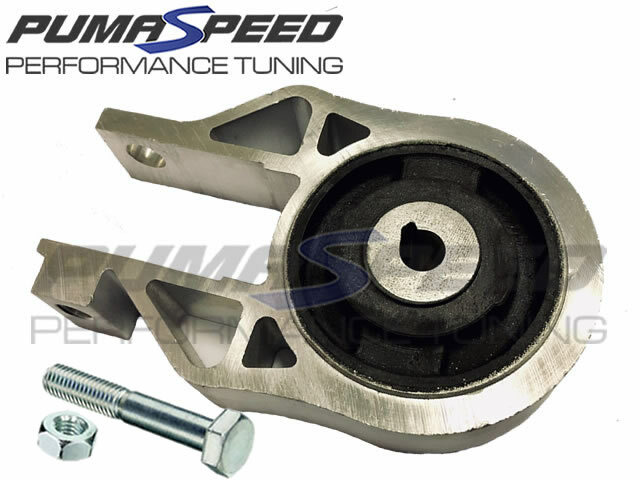 Pumaspeed have a specialist distribution team that can dispatch the Low Vibration Focus Uprated Lower Engine Stabilizer by Pumaspeed to any destination worldwide.